The intriguingly titled Black Music Disaster is part of Thirsty Ear's Blue Series, which for over a decade has documented numerous cross-stylistic collaborations between artists from different genres. This live concert recording, taped in February 2010 at London's Cafe Oto, features a virtual indie summit meeting, presenting renowned avant-garde jazz pianist Matthew Shipp playing Farfisa organ, Spiritualized's founding singer/songwriter J Spaceman and Spring Heel Jack co-founder John Coxon on electric guitars, as well as esteemed drummer Steve Noble. Jokingly named in reference to a negative review of a recent concert by Anthony Braxton, William Parker and Cecil Taylor, Black Music Disaster is anything but. Their audacious self-titled debut consists of a single uninterrupted 38 minute improvisation that ebbs and flows between subtle shifts in mood, rarely settling into anything less than sweltering. Shipp's phantasmagoric organ opens the session, its ominous cinematic swells setting the stage for a bracing otherworldly excursion that rarely returns to terra firma. Noble's sporadic drum fills subsequently introduce droning waves of feedback from Spaceman and Coxon's distorted tremolo guitars that merely hint at the sonic maelstrom to come. The remainder of the date vacillates between dynamic extremes; driving backbeats, psychedelic fretwork and hypnotic organ vamps alternate with brief rubato interludes awash in pithy kaleidoscopic detail. As testimony to the participants' skillsnot only as keen improvisers, but as attentive listenersthe proceedings avoid drifting into chaos despite the high level of amplification and feedback, with numerous examples of focused interplay to be heard. There are no individual solos to speak of however as the quartet embraces a freewheeling collective spirit, subtly inspired by earlier travelers of the spaceways, including Sun Ra, Sonny Sharrock and especially, Tony Williams' Lifetime with Larry Young. Established in 2000, Thirsty Ear's Blues Series strived to change the face of modern jazz, but for every successful collaboration starring hip-hop heavyweights like Antipop Consortium, DJ Spooky and Mike Ladd, there were ample examples of mismatched pairings with DJs and producers whose concepts weren't quite as refined. Occupying the nebulous middle ground between jazz and rock, Black Music Disaster makes amends for the label's prior indulgences, presenting an uncompromising record from a compatible group of artists making compelling music that transcends categorization. Track Listing: Black Music Disaster. 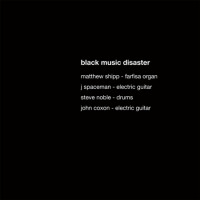 Personnel: Matthew Shipp: Farfisa organ; J Spaceman: electric guitar; Steve Noble: drums; John Coxon: electric guitar.